Ahhh... summertime! This time of year, my thoughts turn to washing fleeces, in preparation for the hot hot months when all I want to do is spin. I like to sew the locks in place, so that everything stays all nice and neat and tidy. Ummm... Dixie, no, this isn't a nice new pad for you. Silly dog. Urk. This is the first dunk in some hot water - this dunk is only water, I'll add shampoo to the second dunk, the first dunk gets rid of the majority of 37 years of dust and dirt and who knows what else. After a nice hot soak in some shampoo - check it out! Pretty clean, yes? Here it is - all nice and washed and clean and fresh smelling and just plain old NICE. This is that super crimpy bit. EEK! Do you see it? It's a 37 year old sheep ked!!! Eeeeeeeewwwwwwww....... By the way, I have some friends who raise meat sheep, and they were once donated a box car full of onions, which they gave to their sheep. They maintain that it got rid of the keds. Just for your general edification, lol. Most of the wool isn't this crimpy, most of it is like the portion on the bottom, fingers added for scale. Can you believe that this lovely, clean, poofy, boingy wool came from that old skanky stuff? 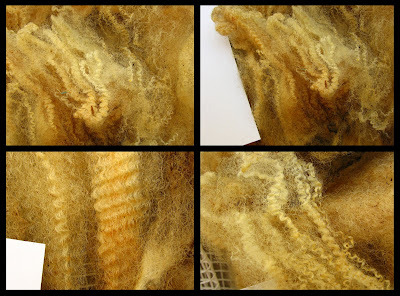 So if you have an old sticky stinky fleece hanging around, and you are thinking of using it for mulch - why not wash a lock or two and see what you discover. You might be surprised. That is very crimpy indeed! I have some finn lamb that is like that. My last fleece (a Shetland) had me picking out large dead June bugs and there was alot of them. The bugs must have crawled onto the sheep and their legs got stuck in the lanolin. Oh, I HATE keds. I think of the poor sheep having to deal with them. But a lovely Suffolk is a treasure indeed. Fresh fiber is a lot nicer to work with in the washing, but it's rewarding to salvage something that's fine underneath but just old. Some Manx Loghtan wool was discovered in an attic and used after I think 50 years of storage. It was fine.